What is the Cobb-Douglas production function? The Cobb-Douglas production function calculator helps you calculate the total production of a product according to Cobb-Douglas production function. Briefly, a production function shows the relationship between the output of goods and the combination of factors used to obtain it. The Cobb-Douglas production function is a special form of the production function. It uses the relationship between capital and labor to calculate the number of goods produced. To learn more about the characteristics of the Cobb-Douglas production function, read the article below where you can find more about the production function definition and production function equation. We've also presented the Cobb-Douglas production function formula, scroll down and check it out! Development of this production function started in the 1920s when Paul Douglas calculated estimates for production factors for labor (workers) and capital (here in a broad sense: money, buildings, machines). He wanted to show how they relate to each other and he wished to express this relation as a mathematical function. Charles Cobb suggested using an existing production function equation proposed by Kurt Wicksell as a base, which Douglas and Cobb improved and expanded upon. The results they got very closely reflected American macroeconomic data at the time. Although accurate, economists criticized the results for using sparse data. Even when conducting small scale research you need a proper sample size to make your results statistically significant. It is even more important when you want to try to estimate industry-wide macroeconomic theories. Over the years, the theory was improved and expanded using US census data, and proved accurate for other countries as well. Paul Douglas formally presented the results in 1947. The Cobb-Douglas production function is known for being the first time a proper aggregate production function was estimated and developed to be accurately used to analyze whole branches of industry. It was a cornerstone for macroeconomics, and has been widely used, adopted and improved since its inception. The importance of Cobb-Douglas production function to macroeconomics can be compared to the importance of the Pythagorean theorem to math. Y is the total production or output of goods. A is the total factor productivity. It is a positive constant, and is used to show the change in output that is not the result of main production factors. L is the labor input which indicates the total number of labor that went into production. K is the capital input which shows the quantity of capital that was used during production. α is the output elasticity of capital. β is the output elasticity of labor. Output elasticity is the responsiveness of total production quantities to changes in quantities of a production factor. It is a percentage change in total production resulting from a percentage change in a factor. The more capital or labor we use, the more of a good we are going to get, but it is not a one to one conversion. It means that a 1 percent change in either factor would not result in a 1% change in total production, but is rather dependent on the level of output elasticity associated with the factor. Each of these values is a positive constant no bigger than 1 and is dependent on the level of available technology (0 < = α < = 1, 0 < = β < = 1). In practice they have to be smaller than 1 because a perfect production process does not exist - inefficiencies in labor and capital occur. Output elasticities can be found using historic production data for an industry. Suppose that output elasticity for labor - β is equal to 0.3. A 1% increase in labor would equal to approximately a 0.3% increase in total production in that case. output elasticity, as mentioned above, is constant. It means that for a given Cobb-Douglas production function for a specific industry the value of α (output elasticity of capital), and β (output elasticity of labor) should not change. marginal product represents additional quantities of output we get by increasing the amount of a production factor used by a unit. In case of Cobb-Douglas production function, the marginal product is positive and decreasing. It happens because output elasticity is positive. It is, however, smaller than one, so the Cobb-Douglas production function has diminishing marginal returns. It means that while increases in capital or labor will result in increased total production, each time the increase will be a bit smaller than before. returns to scale represent the proportional change in output when the proportional change is the same in all factors. For Cobb-Douglas production function returns to scale are equal to output elasticities of both labor and capital: α + β. If α + β = 1 you can say that the returns to scale are constant. It means that doubling the amount of both capital and labor would result in double the output. With the United States industry data available, this is what Paul Douglas observed when he was first establishing the function. Multiplying 25.51 * 2 = 51.02 Indeed, you can see that doubling the labor and capital resulted in doubling the production. If you are having trouble calculating labor and capital raised by an alpha and beta check out our handy exponent calculator. If α + β < 1 returns to scale are decreasing. The proportional change in factors will result in a smaller proportional change in output. If α + β > 1 returns to scale are increasing. Likewise, the proportional change in factors will lead to a higher proportional change in output. It means that using 30 workers and 25 dollars, you will be able to produce 215.13 units of product - in this case, glass balls. Changing the total factor productivity or output elasticities constants in our production function example means that you will use a Cobb-Douglas production function for a different industry - you will no longer be calculating output for glass balls, but, e.g., metal boxes instead. Of course, you don't have to do all those calculations by hand. Let our calculator do the work for you! 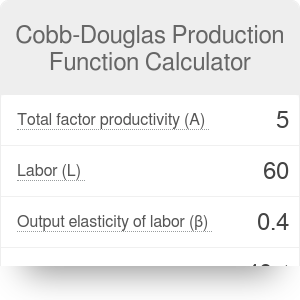 Our Cobb-Douglas production function calculator makes it easy to observe how total production changes depending on the changes in labor and capital. The reverse calculations are also possible. If you want to find out how much capital you need for a particular amount of total production, fill in other variables and our calculator will find that value for you. Cobb-Douglas Production Function Calculator can be embedded on your website to enrich the content you wrote and make it easier for your visitors to understand your message.